The handy AbsoluteIMU-ACG sensor is an add-on to Lego’s Mindstorms set, combing an acceleration sensor, 3-axis gyroscope, and compass into one compact unit consisting of a plastic octagonal shape with a Mindstorms-compatible wire coming from one side and a pair of holes sized to accommodate Lego’s cross-shaped axles, meaning that it’s a cinch to add it to a robot. The plug connects to the Mindstorms brick–either RCX, NXT, or EV3, according to the product page. They also feature mention in passing that the sensor works with Arduinos. Depending on what sensor you’re using and what platform will be taking in data, you may need an UART to i2c logic converter. Mindsensors is a company that makes and sells a large variety of add-on parts for Lego’s Mindstorms robotics sets, including sensors, Arduino shields, servos, cables, and so on. Yes, they do have an UART-to-i2c converter for sale. You’ll also need the software to get data from the sensor. Mindsensors provides NXT-G and EV3 programming blocks you can download from the product page. These, along with some sample programs, give you the basic functionality upon which you can craft your own programs that take advantage of the sensor. It works very easily–you download the blocks and use the Mindstorms software to import them. 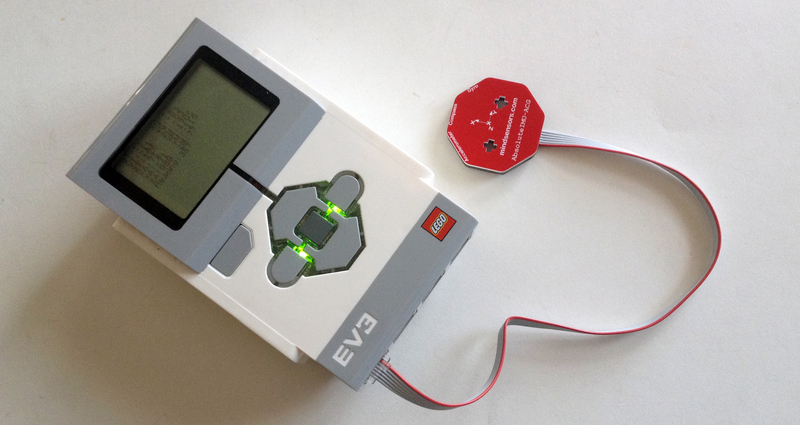 You download the program to your EV3 brick and run it. If you have the sensor plugged into port 1, it’ll display the data from the sensor on the EV3’s screen. You’ll get acceleration, tilt, as well as compass direction, returned in degrees from magnetic north. I was able to get the sensor up and running in just a couple of minutes. One final thing I wanted to mention about the AbsoluteIMU-ACG is that, like the rest of Mindsensors’ products, it is closed source and glued into a shell, making it necessary to theoretically damage the PCB in order to take a peek at it. Their NXShield has a layer of laminate stuck onto the top of the PCB so you can’t see the components. I realize this is for very practical reasons; you don’t want to deal with irate parents after Timmy pries off a couple of chips. That said, as a hobbyist, I would have liked to look at the PCB and it bothers me that I can’t.